Sometimes I wish I was born in a simpler time. A simpler time as those portrayed in Downton Abbey or Jane Eyre, despite the fact those days seemed to have more trials and tribulations than we have today. Knowing me, I would have made things worse. I'm pretty sure I would have been the town gossip due to my rebellious ways. Getting married would not have been the main focus of my life and I would have tried to convince other female friends the same. I would have snuck out of the house without a chaperone by my side and I would have flirted with every boy that passed by. Okay, on second thought, maybe it's a good thing I was born when I was. In saying all of that, I was very lucky to be raised by a family that had simplistic ways. We never lived beyond our means and we only replaced things when they were absolutely broken - and that was usually after my Mom jimmied something to the point she was jimmying jimmies. However, no one could top my Grandma. Grandma was the queen of simplicity - and recycling. In fact, I sometimes think she invented it. She would wash out resealable bags and hang them on slack hangers all over the house to dry, fold plastic carrier bags perfectly and keep them in Velveeta Cheese boxes that had been covered with leftover wallpaper or gift wrap to make them look pretty, torn pantyhose would be filled with potpourri to become sachets for dresser drawers or lint catchers on the dryer, and plastic gallon milk jugs were cut open and used as scoopers for feed or planters for seedlings before transferring them into her garden. She was amazing like that. That's why I'm loving Natrel's 'A Little Good, A Lot of Great' Campaign. Going back to basics and enjoying the simple things in life, like planting a vegetable garden in one's own backyard and watching the fruits of one's labour grow or going for a bike ride with the family on a warm, summer night; picking sweet, juicy organic strawberries at a local farm or switching up conventional milk for organic milk such as Natrel's new line of organic milk. Small steps that can do big things for the mind, body, spirit, and environment. It doesn't have to be something big or crazy to make a difference and it certainly doesn't have to taste bad either. After all, it's the little things in life that matter most. And it's the little things that make the good life even better. Preheat oven to 350ºF/180ºC. Line two cookie sheets with parchment paper or silicone mats. In a mixing bowl, whisk together flour, baking powder, and salt; set aside. In a separate mixing bowl, using an electric mixer, cream together butter and sugar until pale in colour, about 2 minutes. Beat in egg until incorporated. Add in vanilla and milk. Beat for another 10 seconds. Add half the flour mixture to the butter mixture and beat until batter comes together. Add in remaining dry ingredients and mix until dough resembles coarse crumbs. Gather dough with hands and form into a ball. Try not to handle dough too much at this stage. Prepare work surface and rolling pin by dusting with flour. Divide dough in half. Roll out first half to about a ¼’ thickness. Using cookie cutters, cut out desired shapes. Carefully transfer cookies to prepared cookie sheets. These cookies will not spread, so you can place them close together. Bake cookies for 9-10 minutes. (They should be pale in colour). Do not over bake. Remove cookies from oven and transfer to a wire rack. Allow to cool completely. Pour Natrel 3.8% Organic Milk into a saucepan and place over medium-low heat and bring to a simmer. Add in butter and whisk until completely melted. Remove from heat and add chocolate. Whisk until smooth and chocolate begins to thicken. Transfer to a small bowl and place in the refrigerator for about 30 minutes*. Ganache should be cold, but spreadable. *If you happen to chill ganache too long, just remove from refrigerator allow it to come to room temperature. You can also microwave it for about 3-5 seconds – just take extreme caution as ganache can very quickly return to a melted stage). Pair up like cookies together. Using an offset spatula or a piping bag, spread a generous heaping of ganache over entire surface of cookie. 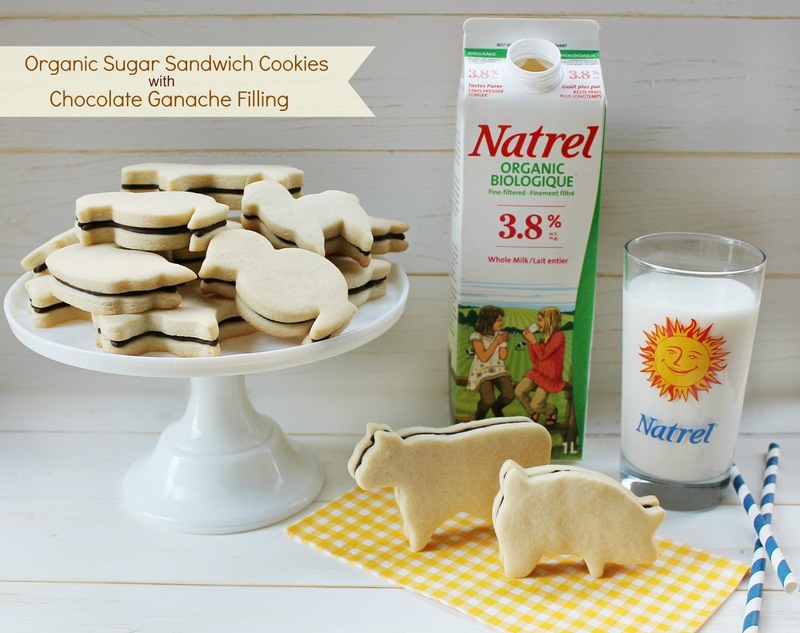 Top with paired cookie and enjoy with a cold glass of Natrel Organic Milk. *Disclosure - I was compensated for this post, but all opinions and views are all my own.